His photos were taken in the forests surrounding Nagoya, a central Japanese city that is said to be named for its peaceful – nagoyaka (なごやか) – aura. 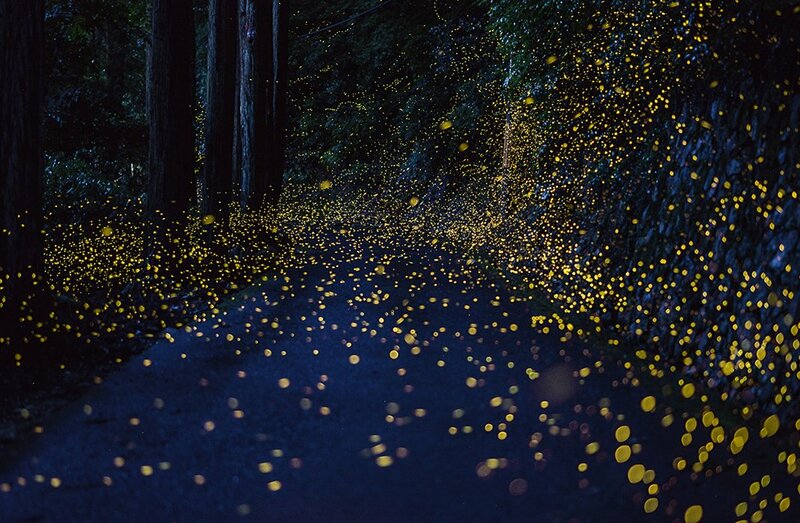 Leaving his shutter open for nearly 30 seconds, Mr. Cyan has created a short series of magical photographs featuring fireflies at dusk. Another Japanese amateur whose photography has gone viral in recent months is Tsuneaki Hiramatsu. 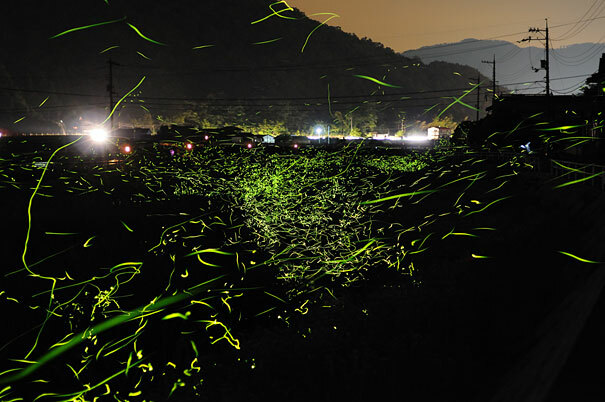 Similarly, Yuki Karo has established herself for her firefly photographs, also taken around Okayama City, although hers are marked by much longer exposures which allow for a visual of the paths these slow-moving creatures take. Lastly, although not an amateur photographer but a world-renowned installationist, one of Ms. Yayoi Kusama’s “infinity rooms” was recently featured in an exhibition in at David Zwirner Gallery in New York City. The installation, entitled “You Who Are Getting Obliterated in the Dancing Swarm of Fireflies”, is now lodged at the Phoenix Art Museum. 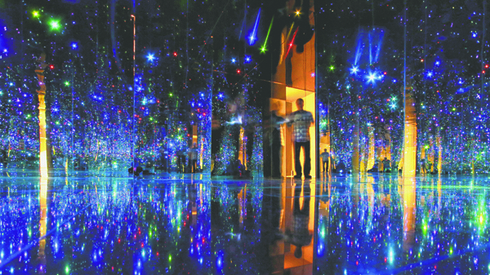 Inspired by a Japanese folk tale about fireflies, the installation takes up a 25 square foot room lined with mirrors and black granite and decorated with over 250 programmed LED lights. According to the artist, the work allows viewers to experience a unique isolation. Ms. Kusama has had a long career in art, beginning in the 1950s and known for covering a multitude of surfaces with polka dots. She has been voluntarily living in a mental hospital in Japan since the 1970s, producing art all the while. 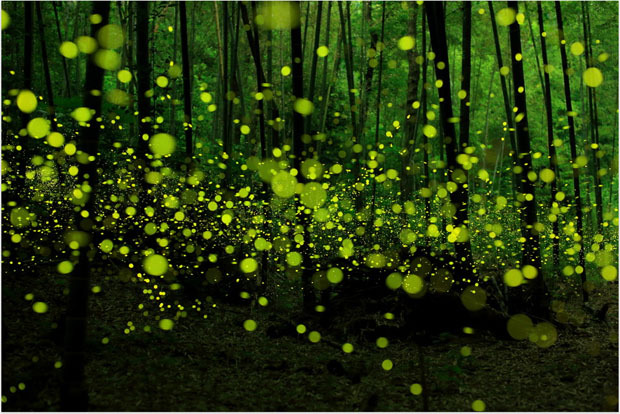 Fireflies are a trend that continually resurface, so stay vigilant for future waves of firefly photographers and artistic interest in insects. To see more of Mr. Cyan’s work, visit his 500px.com site. To see more of Mr. Haramatsu’s work, click here. To see more of Ms. Karo’s work, click here. For more information on Yayoi Kusama, you can visit her personal website. Very interesting. Loved Cyan’s work (I went to his web site). Very peaceful stuff.